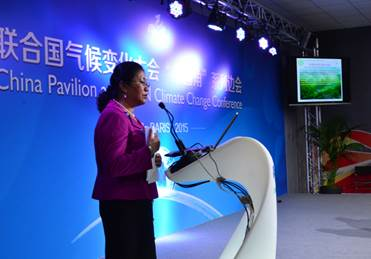 On December 5, 2015 China Green Carbon Foundation (CGCF), All-China Environment Federation (ACEF), Beijing Forestry Carbon Administration (BFCA) and University of British Columbia (UBC) co-organized a workshop on Promoting Green Carbon City to Combat Climate Change at China Pavilion in UN Climate Change conference venue in Paris. 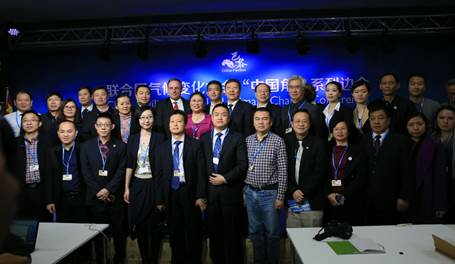 About one hundred delegates from more than 20 countries and international organizations took part in the event. The workshop was hosted by Dr.LI Nuyun, the Deputy Director of Climate Change Office, State Forestry Administration of China (SFA) and the Secretary-General of CGCF. Forestry carbon management experts from SFA, BFCA and Forestry Department of Zhangjiakou Municipal City Government, Hebei Province, academics from UBC, Zhejiang A&F University , Wenzhou Vocational College of Science and Technology and Zhejiang Subtropical Crops Research Institute, leaders from NGOs including CGCF, Laoniu Foundation, ACEF and China National Sand Control & Desert Industry Society, gave speeches on topics about around the purpose and significance of the construction of the green carbon city, technical measures, low carbon city construction, forest protection and water conservation, low carbon economy, vegetation restoration and sandy areas controlling to address climate change, low carbon community building and interacted with participants. The workshop flew the main line of green hills and clean waters are gold and silver mines through telling stories of promoting green carbon city to deliver Chinese forestry sound. It demonstrated a new ecological compensation model to promote the practice of regional economic development under the guidance of the Green Carbon City Index System established by CGCF. 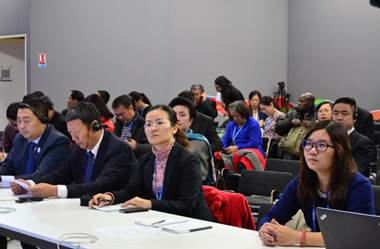 Speeches from invited experts and scholars opened a new window to the international community to view the Chinese community actively support and participate in extensive practical adaptation and mitigation of climate change and its lively success stories. It also showed Chinese forestry ecological civilization, environmental protection practices to address climate change to the global.